This week in Bal/Balika Group 2 Sabha the presentation is based on the ten avatars of Vishnu and introduces the idea of the circle of life (creation, sustenance, and destruction). We are thinking of using geometry to shake things up - yes geometry. We thought that a good way to grab attention and talk about the circle of life would be to introduce some calculus for kids - the very simple notion that a circle is made up of an infinite number of sides. It may seem like this is really complex for Bal/Balika 2, but we have found kids do not really know what is and is not too complex for them and really get into neat ideas when presented in a form of a great story. The simple idea is that if you start with a triangle (the most basic polygon) and keep adding sides you get different shapes. Now if you add lots and lots of sides you get something that looks really close to a circle. However only when you add an infinite number of sides, you get a circle. This can be a game or interactive. Use the picture above, start with the triangle and ask what shape it is and what happens if you add just one more side. 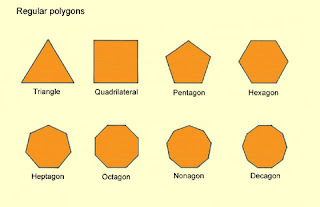 When you get to the decagon, ask what happens if we keep doing this? Use the pictures above to drive home the point that you have to keep adding sides forever to get a circle. Now it is easy to link this to Brahm, Vishnu, and Mahesh. Three corners of a triangle that keep on creating, sustaining, and destroying - forever - to create the circle of life. This can lead to the idea that Maharaj actually is above the circle of life overseeing the whole process. Let us know what you think and if you wind up using this let us know how the kids take to it.